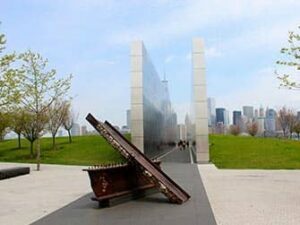 Empty Sky Memorial in New Jersey was erected in memorial of the 746 victims from New Jersey who were killed in the attacks of September 11, 2001. The monument is located in Liberty State Park in Jersey City. It lies at the mouth of the Hudson River, across from One World Trade Center. The memorial consists of two walls with a granite path in between directed towards Ground Zero: the site where the Twin Towers used to stand. The names of the 746 victims are etched on the monument. The name of the memorial is taken from the Bruce Springsteen song “Empty Sky”, which is about the “empty sky” where the towers once stood. How to get to the Empty Sky Memorial? The easiest way to get to the Empty Sky Memorial is by taking the ferry at the One World Trade Center. Continue until you reach the Hudson and take the Liberty Landing Ferry. A one way ticket is £5 and takes about 15 minutes. Get off at the second stop, the Liberty Landing Marina. From here it’s only a few minutes’ walk to the Empty Sky Memorial. Eric’s Tip: If you’re visiting the Empty Sky Memorial, I recommend having lunch at Liberty House Restaurant. You have a beautiful view and the outdoor terrace is superb! 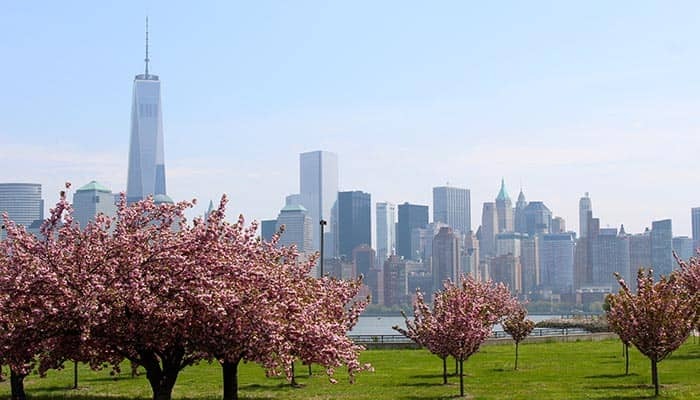 If you’re planning on seeing more of New Jersey, Downtown Jersey City is about a 15-minute walk and from there you also have a fabulous view of Manhattan’s skyline. Take the Liberty Landing Ferry to return to Manhattan.